Other topics include: why to use or not use grey water, health guidelines, grey water sources, irrigation requirements, 17 system examples and selection chart, biocompatible cleaners, grey water plumbing principles and components, maintenance and troubleshooting, freezing, rain, preserving soil quality, storing rainwater, compendium of common grey water errors and preferred practices, suppliers, and references. This 6th edition of the world’s best-selling greywater book includes extensive revisions to every page, a dozen pages of new text, and dozens of new photos and figures, as well as complete information on the Laundry to Landscape system (from the originator of this design). Do-it-yourself Laundry to Landscape is the simplest, least expensive, lowest-effort way to get the most greywater onto the home landscape. This book is of interest to homeowners, do-it-yourselfers, back-to-the-landers, conservationists, gardeners, developers, builders, plumbers, regulators, policy makers, development workers, and researchers. Humans enjoying their role as responsible stewards of the water cycle. into a situation not specifically covered, you'll likely be able to use these general principles to figure it out yourself. Most of the world’s aquifers are being pumped faster than replenished, and all reservoirs are slowly diminishing in capacity as they fill with sediment. At the same time, natural surface waters and groundwaters are being degraded by the wastewater continually dumped into them. Greywater reuse enables you personally to do more with the same amount of water and to increase your water security. At the same time, your greywater reuse reduces the problems of supply and pollution for everyone. Any greywater system will realize some benefits. Obtaining all the potential benefits is trickier than it seems. Many pitfalls await the unwary. In the average installation, this book will pay for itself many times over in savings on construction, maintenance, and errors avoided. Most of the information otherwise available on greywater comes from vendors. Oasis Design doesn’t sell greywater systems, so you don’t have to worry that we’re steering you toward stuff you don’t need. Rather, we make our living by providing information to help people have a higher quality of life with lower environmental impact. First, let’s get your feet wet (so to speak)—what is greywater, what can you do with it, why, how, and some greywater lingo. Any wastewater generated in the home, except water from toilets, is called greywater. Dish, shower, sink, and laundry greywater comprise 50–80% of residential “wastewater.” Greywater may be reused for other purposes, especially landscape irrigation. Toilet-flush water is called blackwater. A few systems that can safely recycle toilet water are included in this book. Wastewater without added solids, such as warm-up water from the hot water faucet, reverse-osmosis purifier drain water, or refrigerator compressor drip, is called clearwater. Reclaimed water is highly treated mixed municipal greywater and blackwater, usually piped to large-volume users such as golf courses via a separate distribution system. It is outside the scope of this book. What Can You Do with Greywater? Conventional plumbing systems dispose of greywater via septic tanks or sewers. The many drawbacks of this practice include overloading treatment systems, contaminating natural waters with poorly treated effluent, and high ecological/economic cost. Greywater reuse follows the same principles that make wild rivers clean…even though they drain many square miles of dirt, worms, and feces. Beneficial bacteria break down nasties into water-soluble plant food, and the plants eat it, leaving pure water. The author is shown here deeply absorbed in his tireless study of this process. Instead, you can reuse this water. 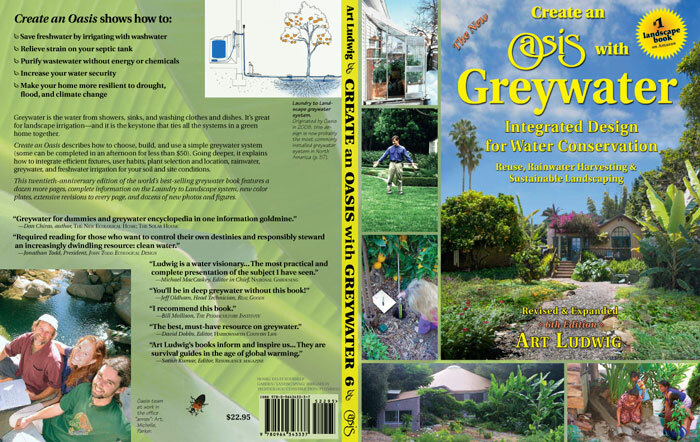 The most common reuse of greywater is for irrigation—the focus of this book. It can also be cascaded to toilet flushing or laundry. Even a greywater-only dispersal system has less negative impact than septic/sewer dispersal, because the beneficial bacteria and roots in the topsoil are better than anything else at treating water. It is said that there is no such thing as “waste,” just misplaced resources. Greywater systems turn “wastewater” and its nutrients into useful resources. Why irrigate with drinking water when most plants thrive on used water containing small bits of compost? Reduced use of freshwater—Greywater can replace freshwater for some uses. This saves money and increases the effective water supply, especially in regions where irrigation is needed. Residential water use, on average, is almost evenly split between indoors and outdoors. Most water used indoors can be reused outdoors for irrigation, achieving the same result with less water diverted from nature. Less strain on septic tanks or treatment plants—Greywater, which comprises the majority of the wastewater stream, contains vastly fewer pathogens than blackwater and 90% less nitrogen (a nutrient that is a problematic water pollutant). Reducing a septic system's flow by getting greywater out greatly extends its service life and capacity. For municipal treatment systems, decreased flow means higher treatment effectiveness and lower costs. Groundwater recharge—Greywater application in excess of plant needs recharges the natural store of water in the ground. Abundant groundwater keeps springs flowing and trees growing in intervals between rains. Plant growth—Greywater can support a flourishing landscape where irrigation water might otherwise not be available. Increased awareness of, and sensitivity, to natural cycles—The greywater user, by having a reason to pay more attention to the annual progression of the seasons, the circulation of water between the Earth and the sky, and the needs of plants, benefits intangibly but greatly by participating directly in the wise husbandry of vital global nutrient and water cycles. Viewed from any single, narrow perspective, greywater systems don’t look that important. A low-flow showerhead can save water with less effort. A septic system can treat greywater almost as well. And greywater systems are more context sensitive than any other man-made ecological system, and more connected to more other systems. Get the greywater just right, and you’ve got most of the whole package right, and that’s what matters. P-trap clogged every other day, but the Branched Drain network never did. no filter, pump, surge tank, or openings smaller than 1" (2.5 cm). states that regulate greywater rationally. A friendly inspector can issue a permit for this system under the CPC/UPC. 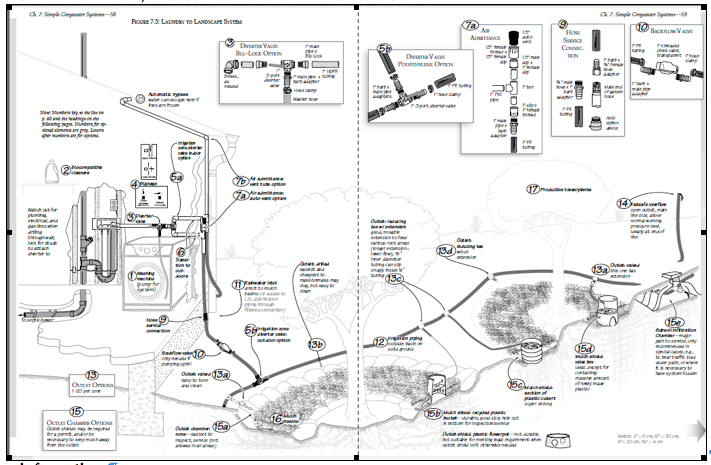 Chapters 9 and 10 explore every aspect of Branched Drain systems in detail. In practice, the health risk of greywater use has proven minimal to nonexistent. It is, after all, the water you just bathed in, or the residue from clothes you wore not long ago. Despite all sorts of grievous misuse (brought on in part by lack of useful regulatory guidance), there has not been a single documented case of greywater-transmitted illness in the US. Nonetheless, greywater may contain infectious organisms. It's poor form to construct pathways for infecting people, and totally unnecessary. Keep this in mind when designing and using a system. 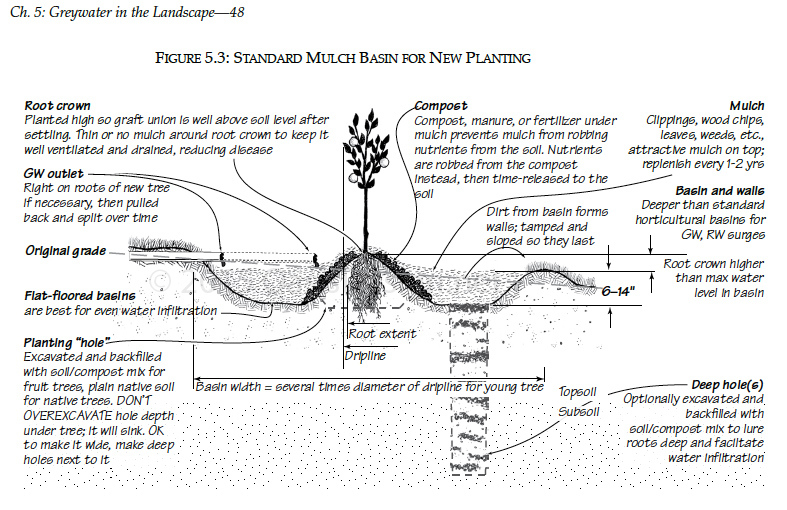 Greywater must pass slowly through healthy topsoil for natural purification to occur. 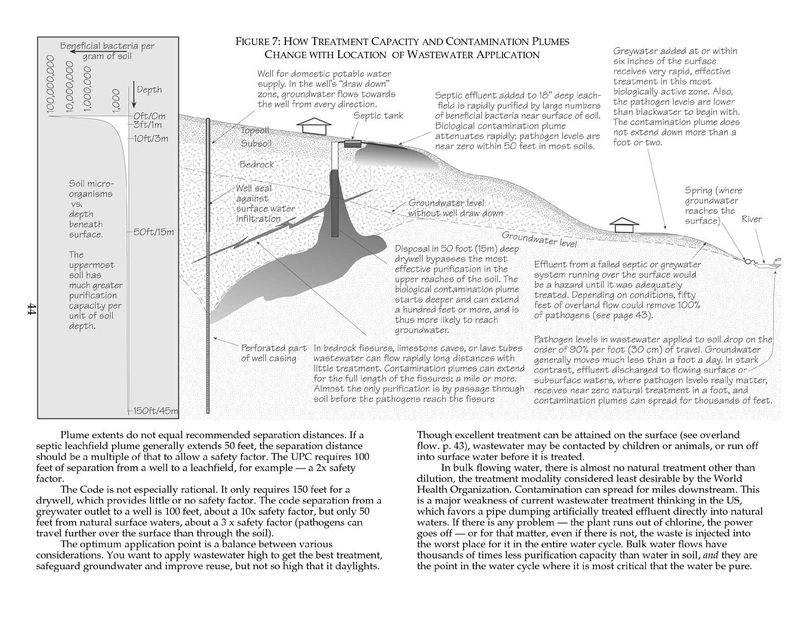 Design your greywater system so no greywater-to-human contact occurs before purification. 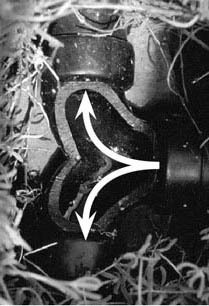 Direct contact or consumption—Solutions: Carefully avoid cross connections (accidental connections between freshwater and greywater plumbing). Label greywater plumbing, including greywater garden hoses. Use gloves when cleaning greywater filters. Wash your hands after contact with greywater. Microorganisms on plants—Direct application to foliage can leave untreated microorganisms on surfaces. Solution: Don’t apply greywater to lawns, or to fruits and vegetables that are eaten raw (e.g., strawberries, lettuce, or carrots). Greywatering fruit trees is acceptable if the greywater is applied under mulch. Pathogen overload—Greywater systems are safest when reusing water that is fairly clean initially. Solutions: Greywater should not contain water used to launder soiled diapers or generated by anyone with an infectious disease. In both cases, greywater should be diverted to the septic tank or sewer. Also, don't store greywater; use it within 24 hours, before bacteria multiply. System overload—If you are having a party and 50 people are going to use a system designed for two, consider diverting greywater to the sewer for the night. Breathing of microorganisms—Droplets from sprinklers can evaporate to leave harmful microorganisms suspended in the air, where people may breathe them. Solution: Don’t broadcast greywater with sprinklers. Chemical contamination—Biological purification does not usually remove industrial toxins. Toxins will either be absorbed by plants or pollute groundwater. Many household cleaners are unsuitable for introduction into a biological system. Solutions: Divert greywater that contains chemicals so they poison the sewer or septic instead. Better yet, don't buy products that you wouldn't want in your greywater system. Contamination of surface water—Greywater needs to percolate through the soil, or else it might flow untreated into creeks or other waterways. Solutions: Discharge greywater underground or into a mulch-filled basin to contain it and slow its movement toward surface waters or groundwater. Don’t apply greywater to saturated soils. 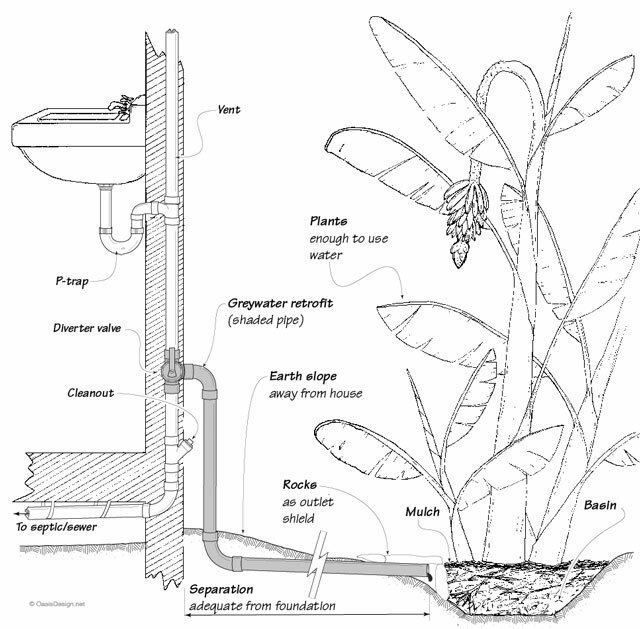 Apply greywater intermittently so that it soaks in and the soil can aerate between waterings. In general, greywater that is confined subsurface or within mulch basins at least 50' (15m) from a creek or lake is not a problem. Contamination of groundwater or well—It is all but impossible to contaminate groundwater with a greywater system, as the treatment capacity of the topsoil is so enormous. Over 90% of plant roots and beneficial microorganisms are in the top few feet of soil, above most septic leachfields. However, if you have a poorly sealed well, greywater running over the surface could potentially pour into it. Solution: The CPC/UPC greywater codes, which are just crude adaptations of septic tank codes, call for 50' of separation between location of greywater application and a well, same as a septic. Probably half of this is sufficient. Home water budget before/ after water makeover, impacts on water and climate commons. We recommend having a licensed plumber involved for collection plumbing even on do-it-yourself systems. Be sure to check out the section in The New Create an Oasis with Grey Water about working with plumbers.